Phase change material (PCM)-based composite heat sinks have attracted great interest in recent decades, especially in the context of thermal management of portable electronic devices such as mobile phones, digital cameras, personal digital assist- ants, and notebooks. In this monograph, a detailed analysis of plate fin and plate fin matrix heat sinks are presented, based on in-house experiments. Performance benchmarks are articulated and presented for these heat sinks. The state of the art in the development of PCM-based heat sinks and the challenges are outlined, and directions on future development are provided. It is our sincere hope and trust that this book will not only be informative but also awaken curiosity and inspire thermal management solution seekers to delve deep into the ocean of research in PCM-based heat sinks and discover their own pearls and diamonds. Rajesh Baby is currently associate professor and head of the department of mechanical engineering at St. Joseph’s College of Engineering and Technology, Palai, Kerala, India. He has over 14 years of teaching experience. He pursued his doctoral studies at IIT Madras, under the guidance of Prof. C. Balaji. He has published nearly 50 papers in various international journals and conferences. His research areas include PCM-based heat sinks, heat pipes, and fuel cells. C. Balaji is currently professor in the department of mechanical engineering at the Indian Institute of Technology (IIT) Madras, Chennai, India. He has more than 180 peer-reviewed journal articles and 70 conference publications to his credit. He has authored four books. He is an elected fellow of the Indian National Academy of Engineering. 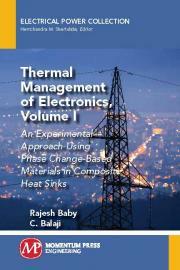 He is currently the editor- in-chief of the International Journal of Thermal Sciences. His research interests include heat transfer, optimization, and atmospheric science.